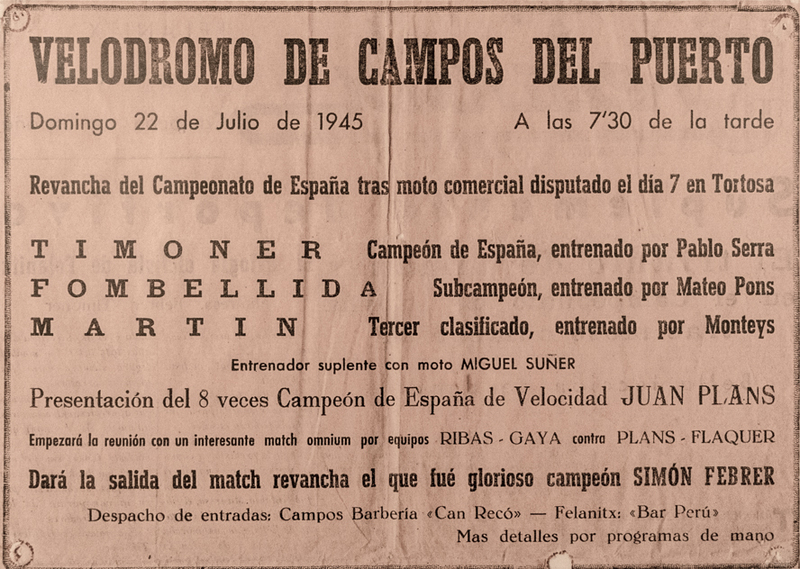 Sixty-nine years ago today, on July 22nd 1945, the Spanish motor-paced cycling champion Guillem Timoner i Obrador was challenged for a race at the Velodromo de Campos del Puerto by Alejandro Fombellida, the Spanish sub-champion and the runner-up, Antonio Martín Eguia. At the race, there was also present Simó Febrer i Serra (1895 – 1989), a Spanish professional road racing cyclist and Spanish champion in 1915 (in Bilbao) and again in 1918 (in Seville). The photo was taken in Campos, Mallorca, Baleares, Spain. The date: June 26th, 2014.